Eligible candidates who wish to apply for this Medical jobs can apply within 30 day from date of publish of advertisement in the employment newspaper. M.Ch in their respective discipline recognized by MCI/Institute of Nation Importance. and Rs.500 for SC/ST Category. 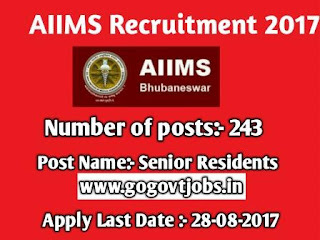 payment is to made to AIIMS, bhubaneswar through NEFT. After the successful submission of the online application form take the printout for the future purpose.